Is there an ideal height for the Matterport camera? I just did my first scan and I set it at about 5' 8" and it seemed to work ok. Just curious if there a height that works better. 5'5" to where the center lenses are. Metroplex360: is 5'5" a company recommendation, or something you have come up with through trial and error? I think I shoot closer to 5' (haven't ever measured) and scans seem to work well. Is there an advantage to shooting a little higher that I'm missing? I just started out scanning around chest height and never really experimented. In my opinion, camera height impacts how realistic the end user experience is. Too low and you're looking at the sides of counter tops like a young child, for example, or too high and you're staring down on things from a birds eye view. Both not like the property would be in "real life". If you think about it that way, 5' 5", or somewhere close to that, gives you something closer to reality (for most adults). and you can navigate an entire model using only the arrow keys (except sometimes to successfully conquer a tight spiral stair you'll need to point up-or down obviously.) This is called 2-point perspective. Scanning high forces one to point the viewer downward-like nearly all of MP's demo tours-which introduces another perspective axis (3-point perspective) which is something the human eye corrects for somehow. Images with 3 point perspective appear unnatural as compared to visual perception and experience. As women are usually the ones deciding on the house they want, I set up my camera so the lenses are at about the same height of an average woman's eyes. That is between 1.5 to 1.6 meters in Argentina (I think it is between 5' and 5' 4" in the US measuring system - any hope you guys will finally adopt the International System of Units ? I have noticed the height on the walk thru may look good but it seems a little high on VR walk thru, so I am trying to work on a height that works good for both, but have not had a chance to change it orcheck it. Has anyone else noticed this? I agree with @HarlanHambright, low is better. I shoot at just under 5'. Give it a try and notice how consistent the walk through looks as you navigate. Or how about this: do you adjust camera height for different rooms? Kitchens generally have higher counter tops and in this case it makes sense to have a higher camera height so viewers are looking down on the counter, instead of sideways at the counter. Bedrooms can easily justify lower camera height since the beds are lower, which can also help to make the bedroom seem larger. @douglogan your point is valid, but if you consider that the same person visits the whole place, then perhaps it is better to maintain the same level for all the rooms. This is my recommendation. I'm 5'9" and I try to line up the center cameras with my chin. I do agree with @douglogan -- camera height can be subjective to what you are scanning. If you are scanning a home with very low counters and furnishings, you might want to consider going lower. If you are scanning a home with very high counter tops, you may want to go higher. I think that the variance should always be between 5'0" - 6'0".. I cannot see any reason to go lower. I've seen childcare facilities done at child height before, which is interesting... that's a case scenario wherein one might want to lower the tripod to the lowest height in areas designated for children. The main argument I see for shooting lower is that virtually all "expert" interior photographers seem to recommend shooting stills at roughly hip height. I've read the science regarding human perception and why that is the preferred height (which is counter-intuitive to the thought that one should shoot at adult eye-level), but can't even begin to remember or regurgitate it here (I'm sure a Google search would bring it up). It would seem that the perspective that works best for stills should transfer well to Matterport. the only reason to shoot high is to assure that the viewer must point downward during the tour inducing vertical perspective keystoning as explained above. I believe the idea behind shooting low has to do with the fact that we don't gaze straight ahead - which would justify shooting at eye level - but instead gaze at about a 20 degree angle downward an average distance (not sure what it is) in front of us. So our focus actually falls well below a point that is in line with our eye height. Notice where your gaze falls next time you're walking and you'll see you're not looking straight ahead, but rather at a moving spot on the ground, maybe 10 feet in front of you. It happens when you walk in a room as well. You may look up and down, but as an average, your gaze tends to fall at a downward angle. We all know that tilting the camera screws up verticals, so I guess shooting low and keeping verticals in line is the compromise. I'm not professing to be an expert here, just paraphrasing what I've read on the issue. I'm just finding this thread as I'm searching for threads about verticals. 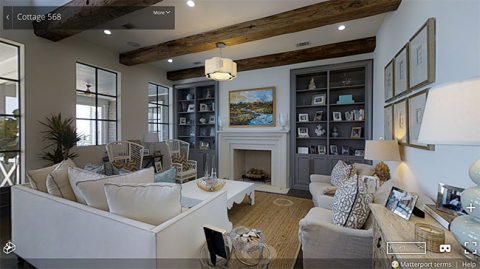 I'm hoping to get some opinion from Matterport with regards to this issue now that they are really marketing the new camera as providing sufficiently high quality captures to use for real estate marketing stills. I'm pretty unconvinced, primarily because of the issue of the verticals in the Matterport images. Whenever I capture images (primarily for Guided Tours) I rarely choose viewpoint angles that result in proper image verticals. 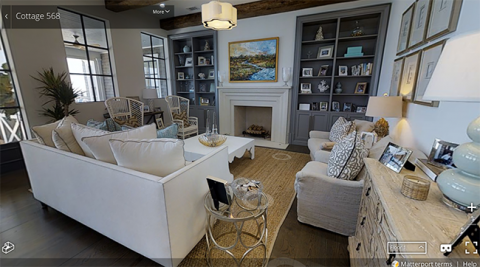 I think this is fine for virtual tours, because it mirrors how we move through a space in real life. But I would (almost) never shoot an image with my DSLR like that. But a little voice tells me that maybe this insistence on proper verticals is just elitist crap. Do people who aren't professional photographers notice or care about image verticals? But I do think Matterport is doing its marketing a disservice by not addressing this issue directly. They should either take a strong stand (and maybe do some marketing research to back this up) that you don't need to have proper verticals in real estate photography. Or they need to start recommending MSPs use much lower camera heights so there's a chance you can capture stills with proper verticals.